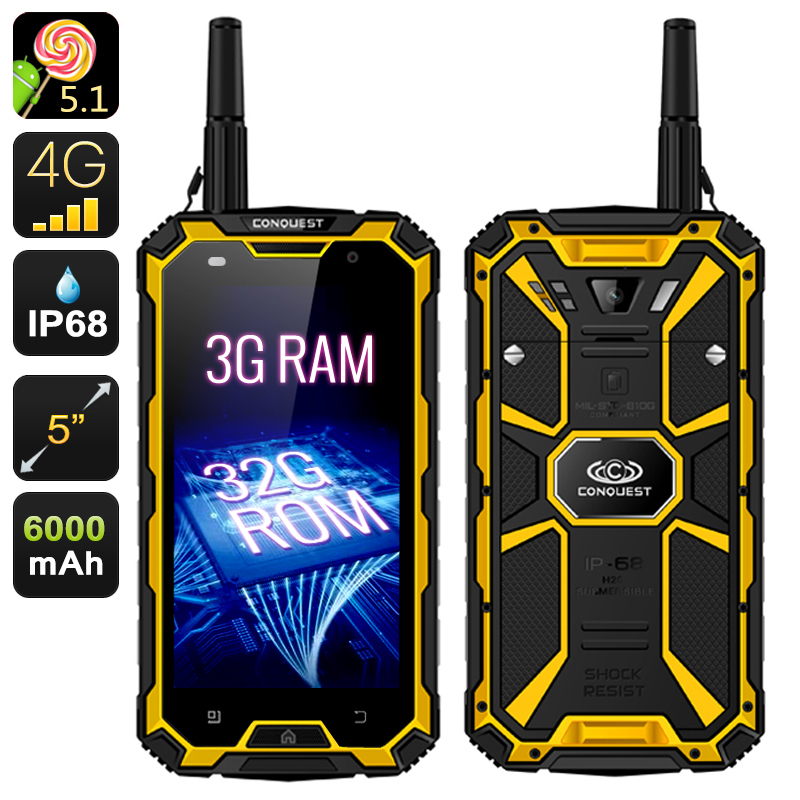 Successfully Added Conquest S8 Pro 3GB RAM Smartphone - 4G, IP68, 5 Inch IPS Screen, IR Control, Android 5.1, Walkie-Talkie (Yellow) to your Shopping Cart. The Conquest S8 Pro 3GB is a powerful and reliable rugged device with lots of smart functionality. It not only comes with the highest level of protection from the elements, featuring the IP68 rating, but also offers its lucky owner great connectivity, navigation and a 13MP camera. One of the S8 3GB Pro’s distinctive features is its 3GB of RAM that open up the doors to lots of usage possibilities. Despite the phone’s rugged exterior, it sports lots of intelligent features. With the Conquest S8 3GB Pro, you are sure to stay well-connected no matter where adventures take you. The smartphone comes with an extensive quad-band coverage, including 4G and features two SIM card slots. You will also have Android 5.1 at your service and access to the Play Store for more functionality. The rugged functionality is, of course, something of note. 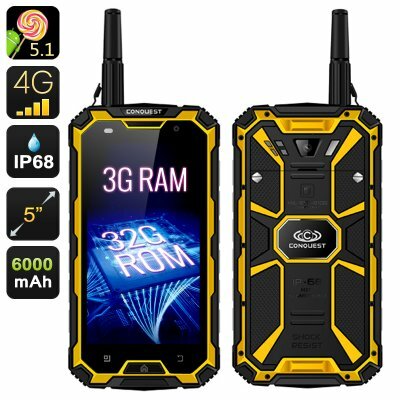 In addition to sporting the highest IP rating – IP68 (dust tight and protected against water and pressure)), the smartphone features GPS and Compass for better navigation, a walkie-talkie for efficient communication with fellow campers and a 13MP camera for catching snapshots of the wildlife and beautiful sceneries around. The smartphone also supports NFC, OTG (USB On-The-Go) and can be uses for quick SOS calls. A large 6000mAh battery offers up to 16 hours of continuous talk time and 700 hours on standby, so you have hours of time to enjoy all your adventures to the max. With full use battery lasts 4-5 days without a problem. I very much like the design. Good for active life style. No internet connection at first, had to create new acess point. Now it works without a problem. I love this phone! wasn't for me directly but i tried the phone for signal levels....and was very good on reception.Other than that good feed back from Customer Service to my questions. Hope is reliable also, and order one for myself soon! Outstanding. Loved it so much my wife wants one.Feedback from Chinavasion is great and will definitely order from them again. if you love the outdoors and want a conversation piece get this phone.Its the same size as the iPhone 6+ with massive amount of battery power and features. None so far and I have been using it for a week now.